Before launching into a summary of Marx’s text I’d like to briefly list some of the things I am specifically looking for in his explanation of the Falling Rate of Profit (FRP). There is so much debate between Marxists over how to properly understand capitalist crisis. Some claim that Marx does not give us a completed theory of crisis at all and that our job is to fill in the gaps. Others claim that Marx provides the essential structure of the argument, a structure which only requires some fleshing out. Then there are those that think Marx’s argument is flawed and requires replacing. This latter group contains those who believe they can construct a theory of crisis still within the framework of Marx’s logic and those who have turned to other theoretical frameworks. Depending on where you fall within this debate you will describe and classify the varying theories differently. For a Falling Rate of Profit theorist (or “Tendency of the Rate of Profit to Fall”, as many will urgently remind you) any appeal to underconsumption lies outside of the Marx’s framework. Some classify underconsumption as a branch of disproportionality theories. Some classify the FRP as a branch of profit-squeeze theory. Others see profit-squeeze as a separate theory relating to wages. David Harvey tries to paint a more general theory of crisis by using the term “overaccumulation”. But some associate this term with underconsumption! What a confusing mess. But isn’t this the way any debate goes? One side will classify the other differently then they would classify themselves. So when reading through part 3 one of my goals is to try to make sense of Marx’s own argument as best as can be done. We know that there are many different types of economic relations that make up a capitalist society. The relations between producers in the market form the basic value relation. The relations of production form the wage-capital relation. The relations between different parts of the capitalist class form the money-capital relation and the landlord relation. Then there’s the state…. With the exception of the state all of these relations are expressed through the primary relation of value. Money capitalists buy and sell money. Capitalists buy wage labor and raw materials and sell commodities. Workers sell their labor power and buy commodities. This means that problems that arise in a specific relation may find their expression not in that relation itself but in the market place. A capitalist may find that she is unable to realize a profit from selling her commodities in the market. Where does this problem come from? We can’t tell just by looking at the market. We must look to the sphere of value production. The current crisis expressed itself at first in the housing market and then in the credit markets in general. But credit expansion is only a problem if not enough value can be created to pay back credit. This takes us back to the labor-capital relation. In all these examples we see that the expression of the crisis is not the same as the cause of the crisis. The market is the mechanism by which the law of value asserts itself on producers. All relations find their expression there. This creates confusion. We see crisis breaking out in the credit market and so we think that is where the crisis came from. But this was only a distant expression of the crisis. Credit bubbles happen because capital can’t find profitable investments in the creation of real value and thus sends capital flowing into fictitious investments which create artificially high, but risky, orgies of high-stakes gambling. There are some modern Marxists who identify this current crisis as a crisis of the credit system. But for the most part we cannot take this seriously as a real Marxist analysis of crisis. 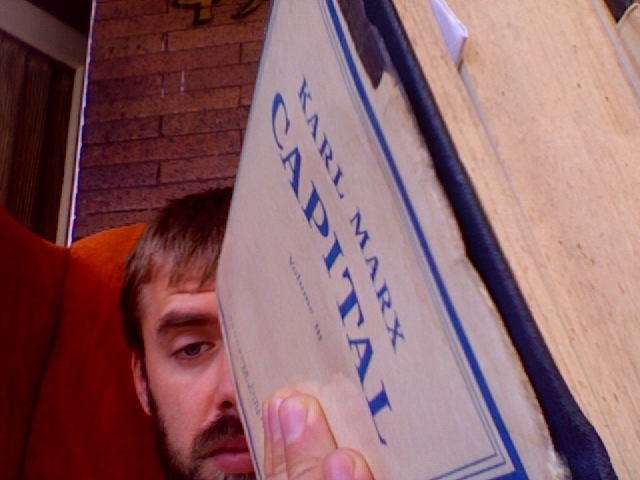 Marx will treat money-capital in later parts of this book and so I will be interested to see how his analysis of money-capital helps explain the way crisis manifests itself, the form of appearance it takes, through money and credit. Obviously underconsumptionist theory sees underconsumption as being expressed through the market. But the tendency of the falling rate of profit (FRP) also must be expressed through the market. Capitalist don’t just look down at their assembly line and realize their new batch of commodities don’t contain enough value relative to expenses to make a profit. They encounter this inability to make a reasonable profit in the market. The subjective experience, the mode of appearance, of the FRP and underconsumption seem quite similar. I am curious as to how Marx presents this world of appearance in relation to the inner dynamics of capitalist accumulation. I want to know how specific he is about the relation between the production and circulation of value. In addition to wondering about the theoretical relation of these different manifestations of crisis I am also reading for critiques and defenses of Marx’s argument that I have read about elsewhere. Marx’s explanation of the FRP relies on his claim that the organic composition of capital rises faster than the amount of new surplus value created. Critiques therefore aim at either the rising organic composition or the rate of surplus value. One often reads that Marx’s claim of a rising organic composition (the ratio of dead to living labor) is cast in ambiguous terms. Is he referring to a rise in the physical quantities of constant capital (machines, factories, raw materials, etc.) or to their values? We know that the rising productivity of labor is constantly causing the values of these commodities to fall. It is argued that just because their physical presence in the workplace increases this doesn’t mean that the value of constant capital is rising. I am curious to see just how ambiguous Marx’s presentation is. The two responses to this criticism that immediately come to mind involve the rising mass of surplus value and depreciation. M-C-M1 means that at the end of each production period there is more profit and that this increased mass of profit must be converted into larger investments. There are a finite amount of laborers in the world. Eventually this mass of profit must incorporate larger proportions of non-people, of products of past labor. I am curious to what extent Marx makes this or similar arguments. Depreciation occurs when a firm has spent huge amounts of money on long-term investments in fixed capital like a railroad or a factory. The cost of these investments will be realized over a long period of time. Yet the constantly rising level of productivity (which is always cheapening these means of production) allows newcomers in the market to buy this same fixed capital more cheaply and produce at a lower cost, selling at lower prices. This devalues the older fixed capital, forcing older firms to take a loss. So if critics of the FRP claim that rising productivity cheapens constant capital enough to offset the FRP they ignore the real, observable ways in which this cheapening causes devaluation which does cause profit to fall. Nowadays many defenders of the FRP point to Detroit as a classical example of this phenomenon: Large scale investments in fixed capital forced Ford and GM into long-term productive strategies that couldn’t compete with Japanese and German firms that came online later with newer, cheaper fixed capital investments. The TSSI guys (Temporal Single System Interpretation) have a word for those who ignore depreciation. They call them “physicalists”, which is a word the reserve for anyone who confuses physical quantities with a fixed sum of value. They say that to think the cheaper price of fixed capital to Nissan somehow lowers the initial expenditures of Ford on fixed capital is to believe in some theory of time travel. I am curious to see how Marx treats depreciation and whether he makes any specific statements about the temporal treatment of depreciation. The other criticism/debate over the FRP centers around “Okishio’s Theorum”. I’m actually less interested in reading this chapter for this issue as I think that the TSSI has significantly disproved the validity of Okishio’s critique. The issue is also pretty technical so I would like to hold off on diving into it right now. Perhaps it can be a topic of a future post. This entry was posted in Kapital Vol. 3 and tagged kapital karl marx crisis falling rate of profit underconsumption credit. Bookmark the permalink. BTW, I believe you will find Vol. 3 very interesting but please don’t search for some monocausality and keep Marx’s dialectical ‘method ‘ in mind, e.g. comp of capital is technological on one side but value relations on the other. A genuine question (which I just posted on marxmail too) directed to whoever. If the existence of capital implies its own self-expansion, i.e. capitalist production and reproduction necessarily implies the accumulation of surplus-value, and therefore technical change and a rise in the productivity of labour (ratio of physical output to labour consumed), what is the *specific* mechanism for the imperative on the part of capitalists to accumulate, i.e. consume productively, (some of) their surplus-value as new capital (rather than consuming it unproductively)? Is “capitalist competition” not specific enough? Help me out here. What am I missing? No, I don’t think it’s sufficient. If a technical change occurs, reducing the unit cost a commodity in a given sector, then, yes, competition forces other capitals to adopt technical change (accumulating surplus-value) too to avoid being priced out of the market. But competition doesn’t explain why the technical change is *first* introduced. Competition as an explanation of the imperative to accumulate presupposes what it needs to explain. Maybe asking why technical change is “first” introduced is the problem since an average level of productivity is never achieved. SNLT is a modal average which means there are always firms that are more or less productive and the system is constantly in motion. In terms of Marx’s quote from the Grundrisse, it seems like competition is still the mechanism. He says “conceivable prior to competition and regardless of competition” while at the same time he says that “only in competition…are the inherent laws of capital realized.” It seems like Marx is not saying that there is another mechanism that executes the laws of capital. Rather he is making a distinction between the laws of capital and the specific mechanisms which carry out those laws. The tendency of the rate of profit to fall is a result of the rise in the organic composition of capital which is a result of the battle for relative surplus value which is the primary form of accumulation under modern capitalism. Perhaps he is making a distinction about vantage point. I think it is plausible to argue that, given that two things in the real world are never *exactly* alike, when you get more than one capital operating in a given sector there is never really going to be an equality of productivity and therefore competition between capitals of different levels of productivity, and hence accumulation of surplus-value as a defence mechanism (‘grow or die’), is built in from the get go. Yet I think that at the level of abstraction Marx is operating on in volume 3 this has to be rejected as an explanation because it is contingent: we need to be able to imagine a ‘pure’ competitive model which is in its initial state composed of capitals or equal productivity, and then ask why would it be that one capital(ist) would accumulate surplus-value as new capital, and hence realise an above average rate of profit. Once this does happen, then, yes, competition does force the other capital(s) to accumulate too – ‘grow or die’. But why does the first capitalist accumulate? If by so doing, she thus does realise a surplus-profit, then I think the answer to why they do this is *in order* to realise a surplus-profit. But this just moves the question to another place, rather than answering it. Why is it that capitalists seek to realise a surplus-profit? The reason I started thinking along these lines was coming across this in Kliman’s ‘Refutation’ book: ‘Whereas Marx and the Okishio theorem assume that innovations are adopted voluntarily, because they raise the innovator’s own rate of profit at least temporarily, Shaikh (1978) and Nakatani (1979) assume the opposite. Innovation in their models is a defensive response to cutthroat competition. The technologies that firms adopt are not those which yield the highest rate of profit given current prices and wages, but those which will best allow them to survive when cutthroat competition in the industry forces down the price of the product. […] Another way of putting the point is that these models identify cutthroat competition, not rising productivity, as the cause of falling profitability. In his presentation of the LTFRP, on the other hand, Marx argued that falling profitability is what causes the cutthroat competition not the reverse. Elsewhere, he explicitly rejected the view that competition can be the cause of a perennial fall in the rate of profit.’ (p. 119) Until reading that I would have answered the question ‘why do capitalists accumulate?’ as you did: competition; ‘grow or die’. But Kliman’s argument is that this is not Marx’s argument. In a comment on your notes to volume 3 chapter 10 here I said this: ‘Capital, which is disinterested in use-value other than insofar as its sale as a commodity allows capital’s self-valorisation, flows, in function of its own mobility, from those branches of lower profitability to those of higher profitability: production expands where demand outstrips supply and contracts where supply outstrips demand. This movement, the product of the competition between capitals of different branches in search of above average profits, is the mechanism whereby the rate of profit for the whole social capital tends to equalise.’ The *whole dynamic* of the movement towards the equalisation of the rate of profit is the movement of capital *in search of an above average rate of profit*. But why? Capitalists accumulate in conditions of uneven productivity of labour because they *have* to. Capitalists accumulate in search of surplus-profit because they *want* to. But why do they want to? And the answer cannot be ‘because they are greedy’, because this just displaces the question again. If capitalists are greedy, why are they greedy? What is it in their social conditions of existence that *makes* them greedy? After my comment above I wrote this: ‘Were, on the one hand, the productivity of labour, and, on the other, the scale and distribution of social need fixed and unchanging, this movement of capital in function of the interplay of supply and demand would generate an equilibrium point where market price and market value would be equal in all branches of production and an average profit would be garnered everywhere. Yet both the productivity of labour and the shape of that social need expressible as money change constantly: *pressure of competition and the need to realise ever more surplus-value impel the capitalist – all capitalists – to cheapen individual commodities*, reducing market value (as well as increasing the organic composition of capital), while social need is determined by the relations between classes and the division of ‘revenue’ into wages and surplus-value, as well as the division of the surplus-value itself into its various forms. As such, instead of a fixed equilibrium towards which the process of equalisation of the rate of profit inexorably orientates, alongside the process of equalisation there obtains an equally strong process of disequalisation of profit rates, such that permanent and shifting unevenness of profit rates and the consequent constant movement of capital towards surplus profit mark the essential dynamic of capitalist reproduction.’ I now think this is in one important respect wrong (or, at least, not consonant with Marx): to say ‘pressure of competition and the need to realise ever more surplus-value impel … capitalists to cheapen individual commodities’ ropes together two different mechanisms: ‘pressure of competition’ and ‘the need to realise ever more surplus-value’ (i.e. the pursuit of *surplus* profit) are different processes based on different (sets of) determinations. Alan Freeman once wrote (here: http://www.ernestmandel.org/en/aboutlife/txt/freeman.htm) that: ‘Capitalists innovate because if this results, for the same outlay of money, in more of the same product than her/his rival, or – which is the same thing – the same amount of this product for less money – then this same capitalist can sell it for the same price as the rival but spend less money. Consequently s/he secures a surplus-profit, higher than the average, for as long as s/he exists on the market side by side with the more backward remaining producers. Characteristically, this is perceived by both the neoclassical synthesis and state-monopoly capitalism as a ‘market imperfection’, as a form of monopoly: a deviation from an apostasized free market. Marx’s argument, and Mandel’s point, is that this surplus profit is not a deviation from the free market, but it is what the free market consists of.’ On the strength of my reading of volume 3 so far, this has to be true in theory; it certainly *is* true in the real world, where it is evident that capitalists will do anything – *absolutely anything* – to realise an above average rate of profit. But what it is that is compelling them to do this I cannot at the moment see. My hunch is that this is all tied in with the question of the *distribution* of surplus-value within the capitalist class; thus my strategy for the moment is going to be to take it as read, to assume it is true, get on with volume 3, and then see. I asked Andrew Kliman for his opinion, and this is what he said (reproduced with his permission). Accumulation of capital needs to be distinguished from technical change (mechanization, etc.). You can have the former without the latter, and Marx begins chap. 25 of vol. 1 of Capital with that case. It is also possible in principle to have the latter without the former, though that’s much less common. But Marx’s explanation of both rests squarely on the reduction in costs of production. There are, of course, psychological factors behind the quest for surplus profit, and indeed behind the quest for profit. Marx suggests somewhere that the key psychological drive is the drive for power (not level of consumption). Also, more profit allows capitalists to withstand averse circumstances, and to have the funds to innovate and accumulate and thereby not fail in the battle of competition. In chap. 25, when discussing the law of concentration and centralization of capital, he argues that economies of scale (factors that make it cheaper to produce on a large scale) is the driving force behind concentration (i.e., accumulation) and centralization (fewer capitals). See p. 777 of the Penguin ed. This is obviously a contingent factor. There are industries in which there really aren’t economies of scale to speak of (e.g., nail salons), so there’s really no imperative to accumulate. And this is what Alan Freeman wrote when I asked him the same question (again, reproduced with his permission). I’ve been involved in this discussion on and off for some decades, and though it’s an interesting one, I’ve never quite understood why it’s considered important. I know about the preoccupation with whether competition merely ‘implements’ the law, but I have personally never understood why this is such an important question. This may be because of ignorance. I would make a couple of points you may find it worth considering. First, you refer to the ‘first capitalist’ at some point. I think this is probably not a useful way to think. Actually, capitalism arose from a historical transition, which Marx discusses at great length (for example in Chapter 20 of Volume 3 or Chapters 30-31 of Volume 1) and it is this real historical transition that we need to study. From this point of view comes my second point: the question is not, I think, ‘in the abstract and in general, what “compels” capitalist to compete by means of technical innovation?’ but ‘how did a system come into existence in history, where capitalists began to compete and were successful in so doing, by means of technical innovation?’ I think this is certainly the way that the problem is posed for Marx, since in many places he asks the question “why is it that capitalism did not develop in Ancient Rome?’ Certainly all the *formal* conditions were present for capital to begin to compete by means of technical innovation. There was science, there was technique-based production often of high quality, there were private capitals, there was an artisan class, an investible surplus, and so on. Yet the owners of capital did not either take it into their heads, or find it really possible, to carry out the kind of systematic investment in relative surplus value that their successors did, two thousand years later. Even today the question is no different. In certain circumstances, capitalists appear compelled to engage in a frenzy of investment in new techniques and almost the only survivors are the ones that join in. This is the case during the height of ‘long booms’ such as the postwar boom. In others, they desert the field, engaging in speculation, land grabs, resource appropriation, rent-seeking or plain old crime, in place of investment. This is the case during a recession, such as now. Thus, I don’t think we will find adequate answers to your questions on the terrain of formal logic (excuse me if I am misrepresenting your enquiry) but on the terrain of concrete historical analysis.